Red poppies in November: What is Remembrance Day? As soon as Halloween is over, every November, you will begin to see people wearing red paper flowers on their coats. These simple flowers are usually pinned on the left lapel, close to the heart, and are only worn for 2 weeks every year. The wearing of the poppy symbolizes that Remembrance Day is near. But what does this mean? Keep reading to find out. These paper flowers are poppies, and to put it simply, they are an act of remembrance. Canadians and other members of the Commonwealth wear these poppies in the weeks leading up to November 11. You can buy a poppy almost anywhere; small boxes are set up in grocery stores. Larger displays are run by current and former members of the military. There is no fixed cost for a poppy; you are welcome to pay whatever amount you are comfortable with. All proceeds go to support Canada’s war veterans. 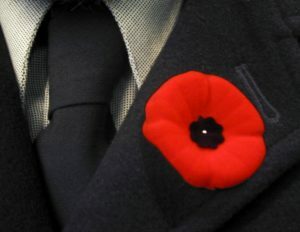 Canadians wear poppies specifically because they grew in some of the worst battlefields of World War 1. Their red colour symbolizes the blood that was shed there. Remembrance Day in Canada is observed on November 11 every year. November 11 – at 11:00 am, specifically – marks when the Armistice was signed to end the First World War. November 11, we remember the great sacrifices made by the millions of men and women who died in Canada’s wars. Because Canada was a British colony at the time, 400,000 Canadians were sent to fight and serve under the British flag. Canadian soldiers and officers distinguished themselves in many battles, notably at Vimy Ridge, the Somme, Passchendaele, and Amiens. However, the human cost was large: nearly 60,000 Canadians died during the war. Despite this tragedy, many Canadians felt that they had gained a huge victory together. At the time of the war our country was very young; less than 50 years old. World War 1 became one of the first times Canadians worked together under the same name. The sacrifices made by Canadians and the resulting victory turned into national pride and the forming of a distinct Canadian identity. This moment in time was very important when Canada finally became a nation independent of Great Britain. Today, Canadians observe Remembrance Day to remember those who died in World War 1 and conflicts before and since. These conflicts include World War 2, the Korean War, Bosnia, Kosovo, and conflicts in the Middle East. We wear a poppy to remember, and as a sign of respect to those who fought and died in war. The poem In Flanders Fields is very famous in Canada and is repeated every Remembrance Day at ceremonies held across the country. You can hear the poem below.